Panda, Owl and Sheep come across a big puddle. Panda and Owl jump over it, but Sheep is too scared. Can Panda and Owl convince Sheep to jump over? 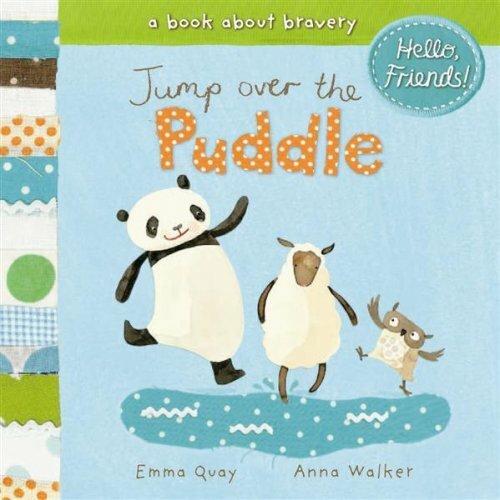 ‘Jump Over the Puddle’ is a beautifully gentle story which will be reassuring for any child with fears. The short and simple sentences mimic the language of little ones, allowing them to relate to the story. It is a fantastic book for teaching the location concept ‘over’ as the word is repeated multiple times with illustrations showing the animals jumping over the puddle. Children love acting out the story to develop their expressive language skills and consolidate their learning of the preposition ‘over’. For further speech and language targets in Jump Over the Puddle, see the list below.